Trombone Shorty: You know, the Juilliard thing was just a thought, I never signed up for any paperwork or tried to get a scholarship. It was just a thought in my head and then I got that call from Lenny and I realized that once the kids get out of school and we finish school, we’re going be struggling to try to pick up a professional career. But I was already there. This school of rock with Lenny Kravitz, I was already a major fan of his and wanted to get more knowledge about that style of funk and rock, and who better to get it from than him. Nick Spitzer: I’ve noticed a lot of times in the sets you’ve done over the years, you have an amazing ability to keep trad [jazz] alive, play later forms of jazz, modern jazz, soul, funk, hip-hop, rock and it all just seems to fit together. It doesn’t feel like anything is a subgenre, everything is all Trombone Shorty music. TS: Yeah, yeah. It wouldn’t work like that if I didn’t have this great city to pull from inspirationally, to be able to hear that, to be able to drive down St. Charles and hear Art Neville up here, and to drive down and hear Rebirth Brass Band. Whatever I play, I really try to learn as much as I can to respect that art form and that genre of music and get as much as I can. It’s almost like a method actor. You got to really believe in that part and do the proper amount of work it takes to understand so you can be authentic. I’m probably out of town more than I’m here, but whenever I come back there’s always some type big ball of energy in the music community. It’s incredible. I don’t know most of the young musicians. I don’t even know if they’re from my neighborhood or from New Orleans. NS: That’s right, you’re a senior citizen now. TS: Yeah that’s right. I got to get the AARP card. NS: Now I do talk to a lot of the older guys. Some of them are worried that the city’s changing more than they like. TS: Yeah, things change. It’s definitely changing in the last ten years. Treme is not the same. And I think that’s just going to happen. We just have to do our part to make sure that we keep intact what’s important, what’s the fabric and heartbeat of the city. And I think if everything else changes, the culture will always live. NS: Another way of passing on knowledge is to start with the really young ones. You did an illustrated book not too long ago. TS: Yeah, based on my childhood. 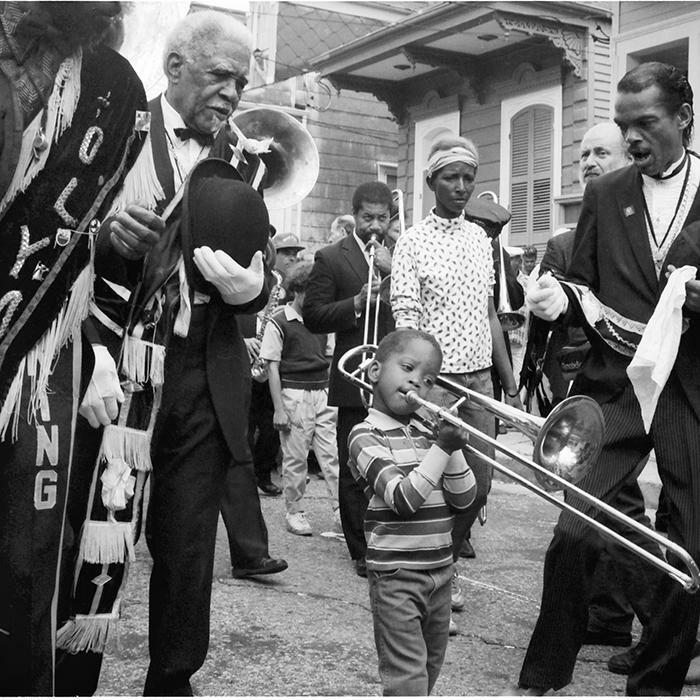 I had a band when I was about six years old — the Trombone Shorty Brass Band. We played all over the city for birthdays. But our office was in Jackson Square. That’s our office there. And it wasn’t really about busking. It was more because we were so in love music, Tuba Fats and my brother. The neighborhood was really a musician’s village. The book is about childhood and being a part of bands and learning how to be a leader at a young age and splitting up money. NS: Well this is interesting because now this is a way to reach kids all over the world. You did do soundtrack for the Peanuts movie. TS: Yeah, I did Miss Othmar, the teacher that nobody ever sees. It’s just a voice. I got a bunch of mutes, like five mutes, and a plunger, and different things like that. NS: Do you have a feeling of being able to keep this level of intensity, energy, and creativity? TS: I think building a career, grassroots, and just continuing to play, and being passionate, we’ll be okay. The late Jerry Wexler was born into a Jewish working class family in New York City in 1918. A combination of good ears, business sense, and chutzpa took Jerry from Manhattan window washer to the top of the R&B charts, producing artists like Ray Charles. Before his career as a record producer, Jerry Wexler did stints at BMI music publishing, Billboard Magazine, where as a writer he coined the term rhythm and blues.